When children are young, their parents collect every greeting card, stick figure drawing, and cast off toy that passes through their sainted offspring's possession. These items are carefully preserved, becoming cherished icons, displayed for grandparents and visiting relatives, and wistfully reviewed alone on rainy days as the child grows older. Eventually, they are consigned to storage where they sit for decades until Mom and Dad (now Grandma and Grandpa) need the space. Bizarrely, this is when they decide to give them back, and we, the adult children, find ourselves looking at box of our childhood belongings wondering, "What am I supposed to do with this stuff?" I was asking myself that very question when I rediscovered my very first time piece, a Timex Peanuts wristwatch with a Snoopy dial. Once the rush of nostalgia wore off I realized something. This is an impressive little watch. 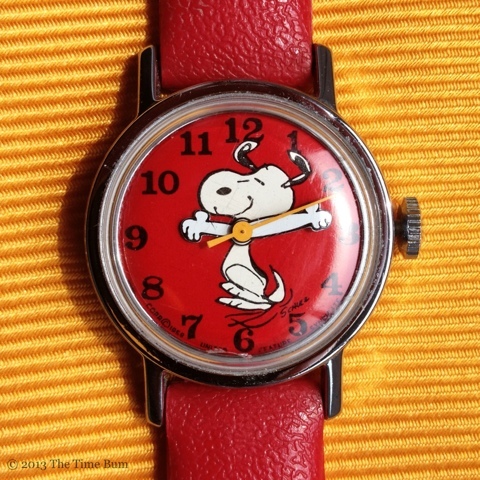 The Peanuts character Timex watches were first introduced in 1969 and produced through the 1970s. 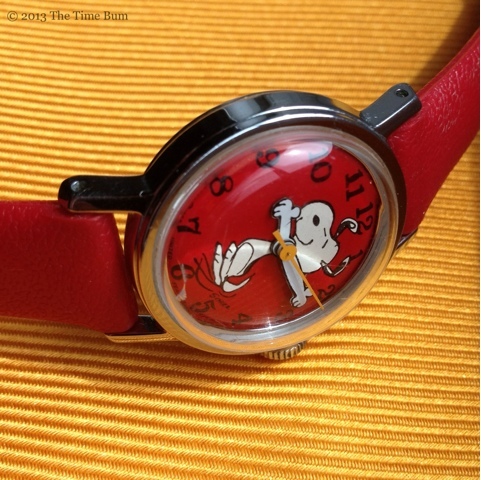 A Timex of this era should have an eight digit number at the bottom of the dial to identify model (first four) movement (next two) and year of manufacture (last two); however, on this watch, the space below the indices is filled with the the 1958 United Features Syndicate copyright for the Snoopy image, and the number is likely printed where the dial fits under the case, so its precise identification will have to remain a mystery for now. Suffice to say that this one graced my wrist sometime around 1975. The dial is bright red with black Arabic numerals in a serif typeface, and an orange second hand. It is decorated with a dancing Snoopy whose arms form the hands. Being a child's watch, the case could fit between the lugs of some larger watches, measuring only about 25mm wide and 33mm lug-to-lug. The back plate is stainless steel and the case is chromed base metal that has weathered the years without any pitting or flaking. The red rubber strap is a similarly modest 13mm wide, tapering to a positively tiny chrome buckle. It too is in remarkably good shape, but if a strap change were necessary, drilled lugs would make it easy. The movement is a hand wound Timex Base Model 24. After sitting for well over 30 years it set and wound easily, then proceeded to tick away the hours without complaint. Power reserve is not great, only about 32 hours. Accuracy was difficult to pinpoint given that the minutes are marked by a fat set of paws, but more than adequate for lunch time, nap time, and bed time. I am quite sure this watch did not have an easy life. The marks in the domed acrylic crystal attest to that. As a kid, I remember winding it over and over, pushing that spring to full stop just because I could. It has no water resistance listed, but it survived messy play times and the occasional dunk in the bath, although I would not be willing to try that today. Needless to say, it has never been serviced. These movements were designed to be cheap, tough, and disposable. It met the first two criteria, and exceeded expectations for the third. You can keep your G-Shocks and Marathons. Clearly, they've got nothing on a child's Timex. A 1977 Timex catalog shows a list price of $14.95, or $57.63 in today's dollars. That is about what they go for today, although some eBay sellers are asking over $100 for units still sealed in their original doghouse shaped packaging. So what do we have here? A watch that ticks all the boxes for a watch nerd: vintage design, mechanical movement, solid build quality, drilled lugs, a domed acrylic crystal, and bags of charm. Despite its Lilliputian size, the watch has a certain presence, aided in large part by its arresting color scheme and high dome. Just like Timex claimed back in the day, it took a licking, and has indeed kept on ticking. Think of it as a Vostok Amphibia for the juice box crowd. Granted, it wears even smaller than the Amphibia does, and the original strap can't make it around my 6.5" wrist, but it is a gem nonetheless. While it might be amusing in an ironic, hipster way to wear it myself (on a World War One style cuff, perhaps? ), I think this one will stay in the watch drawer until the day comes to hand it down to the next generation. I am quite sure it will be ready. Pro: Cheap, cheerful, and tougher than a drunken wolverine. Con: Really only cool if you are under 10 years old. Sum: Snoopy is way cooler than Micky. The Time Bum is keeping this one for Bum Jr.